Whether you’re building a verandah, a patio or, specifically in our case, a carport, one challenge that many householders face is having to build in a tight, narrow space. As well as the simple necessity of making sure there’s enough width for your car and any other items you want under your carport, you also have to consider height and, if at all possible, natural light. 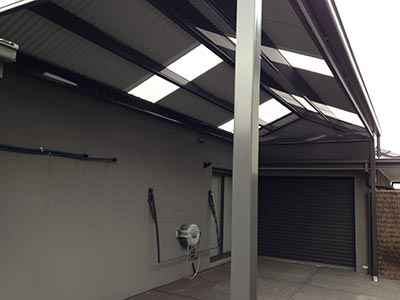 Such was the case for this Melbourne carport, a project undertaken by Mr Carports in the Bayside suburbs. The narrow area where the single carport was needed was very dark and dim already, so it was important not to make it even darker by installing a low carport. So, when designing the carport, our Melbourne team took this into account. The solution that the householders warmly welcomed was to utilise a simple yet stylish gable roof. This not only physically gave the carport extra height, it gives the impression that the roof floats above the area. Contrastingly, a flat roof would have felt and looked cramped, crowded and closed in. Just as importantly, the added height allows far more natural light to enter the Melbourne carport. This was further enhanced with the addition of clear Laserlite roofing sheets, interspersed between Colorbond roof. While the roof gives the impression of floating, perhaps needless to say it’s very much firmly attached to the structure. Firmlok beams were chosen for the structure of the Melbourne carport. These steel beams are light yet very strong, and won’t warp or split like timber can if not well maintained. Speaking of maintenance, the other advantage of the Firmlok and in fact the entire Melbourne carport, is that all components came in a pre-painted colour to match the colours of the house. Making the carport virtually maintenance free. An added bonus for the householders! Why choose Mr Carports for your Melbourne carport? Extensive experience. We’ve been building carports since 1991. We build customised carports in the style and size that you need. We come to you to discuss your carport and provide a free design and quote. All our carports come with a 10-year structural guarantee. We only use quality products and materials. We have a fixed price promise, so the quote will only ever change if there’s an unforseen circumstance, such as finding rocky ground during excavation. Want to know more? Give us a call on 1800 557 782 or view our Melbourne carports page for further ideas and information.